Bengaluru: GE Healthcare on Thursday announced the launch of Brivo XR115, a next-generation ultra high frequency (200KHz) mobile X-ray system designed and developed in India for the world. The new GE Brivo XR 115 addresses five critical problems faced by radiologists and radiographers — image quality from mobile machines of critical anatomies like the spine, patient discomfort which can occur while shifting from hospital bed to the X ray room, higher radiation uncontrolled patient movement that occurs during paediatric imaging, and the potential safety issues that can exist moving equipment between wards, according to a statement by GE Healthcare. X-ray is the primary and most widely used imaging tool in healthcare. India is home to about 100,000 traditional X-ray systems producing an estimated 100 billion X-ray images a year. The majority of these X-ray systems are old generation technology plagued by critical problems. 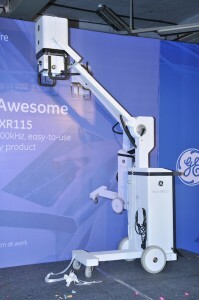 GE’s new Brivo XR115 ultra high frequency 100 ma mobile X ray provides a solution with great images of all anatomies, lower radiation dose on account of ultra high frequency technology, freedom of mobility for its light weight design, lower maintenance cost due to safe design and, the added peace of mind for radiographers, radiologists and patients, the statement said. “We are attempting to address the severe challenges faced by Indian healthcare providers by building a healthier India through technology innovation. Our customers asked us to make X-ray imaging, the first step in better diagnosis safer, more affordable and accessible. Here we are, with Brivo XR 115 addressing all their challenges and helping build a healthier India,” said Terri Bresenham, president and CEO, GE Healthcare, South Asia. “The Brivo XR115 will bring complete peace of mind to the radiologist, radiographer and patient alike. Keeping in mind the concerns of radiologists and physicians, our research team and designers have created a safer imaging environment by reducing X-ray exposure time, lowering radiation dose and providing exceptional images,” said Shireesh Sahai, director, DGS (detection and guidance solutions) and surgery, GE Healthcare, South Asia. Research Brivo XR115, GE Healthcare, Health News, health tips, medical news, Mobile X-ray System, Shireesh Sahai, Terri Bresenham. permalink.